Toronto, ON: Sumach Press, 2008. There you are, Ryan stepped through the patio door. I heard you were having a pretty good time with some guy downstairs. She assumed he was joking, but before she could answer he kept going. Chad said you were, like, grinding up against one of the guys down there. July felt acid rushing through her veins. Her eyebrows furrowed, still angry from abandonment, she snapped, Who the hell do you think you are? Me, dancing with other guys? Try me being ditched, hanging out in a dark living room by myself, getting harassed by a blue-haired jerk, feeling stupid as hell on the outside of somebody else's crowd, then finally getting yanked into a mosh pit only to be accosted by an elbow, a hand and now, you. Bite me, she said and turned her back. He walked over to her and touched her arm. Okay, I'm sorry, I get it. I didn't mean to go all 'jealous boyfriend' on you, but I pictured you with another guy and I just…I don't know,' he said sheepishly. July is a 16-year-old who moves from her familiar urban life in Vancouver to the interior of British Columbia. Instead of her friends, easy mobility and the mall, she is confronted with a new school and countryside which seems both interesting and frightening at the same time. On top of this physical upheaval, July has to deal with her emotions following the death of her mom in a hit and run accident and a new lifestyle with Marie, her other parent. Eventually July has a new girlfriend, Kari, and a boyfriend who lives just down the road. But as the story goes on, Ryan becomes more and more demanding and controlling. What starts out as love and attention begins to turn ugly. 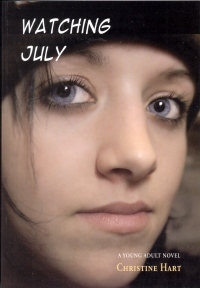 Added to this are various weird happenings, 'freaky stuff' that July just can't ignore: the sensation that someone is watching her, strange words appearing in her diary, her mother's jade ring turning up in odd places. Is her mother trying to tell her something from beyond the grave? Was there more to her death than July has realized? This young adult novel includes elements of both suspense and romance and is vividly set in the interior of British Columbia. Hart understands her characters, and so their speech and their actions ring true. July is a strong female protagonist dealing with demanding relationships: her new classmates, her second mother, her sister, her boyfriend. This romantic relationship is especially important in the book and leads to questions around exploitation and abuse. July confronts these and many other issues in this contemporary coming-of-age novel. If there are any concerns, they are that Hart has perhaps been too ambitious for one short novel. She touches themes of teenage rebellion, peer pressure, lesbian relationships, mental illness, relationship abuse, grieving and the supernatural. At times, there seems to be too much for July – and the reader? – to handle. One feels Hart wanted to pack everything in this first novel. That criticism aside, the book moves quickly, and readers get a good sense of July's feelings through her diary entries. Young adults will be caught up in the roller coaster of emotions and events which make up this most readable novel.